Dawn is descending into its final, lowest-ever orbit around the dwarf planet Ceres, 10 times lower than its ever been before. NASA’s Dawn spacecraft will begin collecting gamma ray and neutron spectra to optimize research and knowledge of the topmost rock and soil layer compositions while taking high-resolution photographs of the cratered terrain. As the spacecraft spirals downward around the dwarf planet Ceres, it aims for an elliptical trajectory that will travel within 50 kilometers (30 miles) of the surface at its low point. After the 2007 launch, Dawn finally entered orbit around Ceres in March 2015 after wrapping up similar studies at the dwarf planet Vesta. The spacecraft had not fired its ion thrusters since last June, orbiting Ceres once every 30 days. The spacecraft now uses engine No. 2 to slowly lower its orbit. 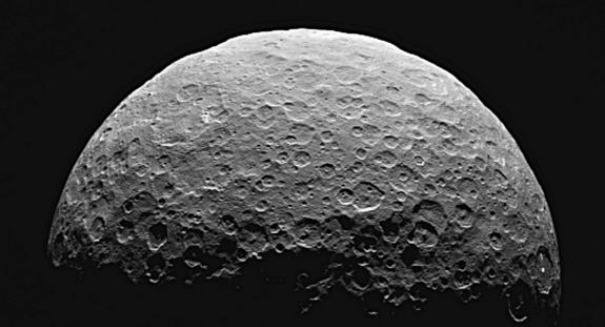 NASA’s goals and objective are to synchronize Dawn’s orbit with the nine-hour four-minute rotation of Ceres to ensure the spacecraft will repeatedly fly over a specific point on the surface – Occator Crater, where highly reflective salt deposits are visible – during the low point of each orbit. “The flight team will synchronize the orbit so that each time Dawn swoops down to low altitude, it does so at just the right time so that Ceres’ rotation will place the Occator geological unit under the probe’s flight path,” Rayman writes. The spinning reaction wheels that once helped Dawn control its orientation no longer work, forcing the spacecraft to rely on small thrusters instead. Those thrusters have a small but noticeable impact on the trajectory, as do areas of Ceres that have slightly higher or lower densities, resulting in slight changes in the total gravitational pull experienced by the spacecraft. Dawn’s camera will image an area 3.4 kilometers (2.1 miles) across.